RSA House, an award-winning venue in Central London, has revealed its re-designed Vaults following a 9 month programme designed to make the spaces even more flexible and to appeal to today’s tech-savvy buyer. 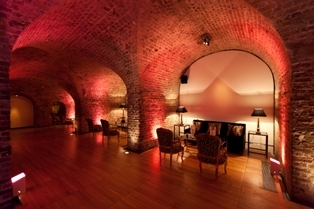 The historic Vaults draw on the House’s Georgian heritage and are set to become the go to location for product launches, drinks receptions, hip parties and high profile dinners. The generous spaces with expansive ceiling heights provide a stunning backdrop for events of up to 220 guests. RSA House’s purpose-built theatre, The Durham Street Auditorium, which is ideal for screenings, meetings, and conferences, is also now re-open for event hire following the 9-month re-development programme of the Vaults. RSA House welcomed its first client to the newly launched space in October when global IT specialist Mozilla hosted ‘Mozfest’. The week-long event utilised the entire House, with the intimate evening talks and socials taking place in the Vaults. RSA House has been informing the agenda for more than two centuries; a space for thinkers to discuss and for narrators to inform and impart knowledge. The House affords organisers a unique environment in London’s prime heartland, with its Georgian features balanced with progressive technology and world-class service levels.